he Puritans saw America as a “city on a hill.” John Adams believed God orchestrated the founding of the United States to preach the gospel to the ends of the earth. Such notions now seem like faint dreams. Instead of evangelizing the nations, they are coming here to preach to us. We have lost our way. We have so privatized sin that we fail to see its corporate dimension. It is never merely a personal matter. It is a pollutant a virus that spreads through populations, a cultural cancer that grows on our institutional soul. When ancient Israel sinned, a solemn assembly was required. The nation gathered and repented. They understood that sin had national consequences. They saw the connection between a good harvest and divine favor; national safety and the protective hand of God; human health conditions and God’s mercy. Today, we attribute disasters to bizarre weather patterns, El Niño, tectonic plate movements, solar flares, the dance of the jet stream, and the collision of hot and cold fronts to some force other than God. We completely disallow a God of judgment into our national discussions. We have invented a nice God, sweet and toothless. The last national solemn assembly in the United States was called by Abraham Lincoln in the midst of the Civil War—150 years ago. In the Scriptures, sacred assemblies were called by kings, priests, and prophets. Is it likely that any branch of the United States government would call the nation back to God? Are we stuck with a ledger filled with national sins: abortion, drugs, violence, sexual immorality, family disintegration, the oppression of the poor, the worship of false gods, the welcome of witchcraft, the failure to discipline our children or ourselves, the failure to pass our faith to the next generation, the removal of God’s laws from the land, the war against all that is sacred—particularly the sacred name of Jesus? What are we to do? There is a “wild card”—2 Chronicles 7:14. Here is a template for a grassroots spiritual initiative. Here we find open identity with God—no shame, no hiding of our light, no intimidation. A bold but humble openness is to be associated with His name. The Septuagint substitutes repent for “humble.” Humility is the heart posture; repentance is the evidentiary action. Believers today are so resistant to repentance. Oblivious and in denial about our own sins, we comfort ourselves that they are less egregious than national wickedness. The problem is that a culture so far from biblical norms must be led back to God. That requires each believer to model repentance. If we will repent and live godly, upright lives, a powerful message will be conveyed to the world. However, “If it is with difficulty that the righteous is saved, what will become of the godless man and the sinner?” (1 Peter 4:18 NASB). The world will sooner repent over our example, our solemn respect for God’s holiness, than before our pointing finger. If we do not honor and revere righteous standards, the nation cannot be expected to do so. The word here is palal—to “intercede.” It is a courtroom term implying God as Judge. Here we act as an advocate for another, appealing on their behalf. First, we humble ourselves repenting; and only then can we represent the nation. The Douay-Rheims Bible says we, “being converted [ourselves having experienced change] shall make supplication.” Here we appeal for mercy in God’s courtroom. We ask Him to repeal the due sentence and stay the judgment. Prayer cannot be merely to avert disaster or looming judgment. The lost relationship is primary. We do not not merely seek the hand of God; we seek His “face”—His smile and approval. We seek His watchful and protective care, to hear Him and be heard by Him. We are approaching some cataclysmic point. Thus we model righteousness and restraint, hoping the nation will follow. We who are called by His name must demonstrate spiritual renewal. Feet follow hearts. Transformation is observable. A turn to God requires a turn “away from their evil practices” (ISV). It involves a “repudiation” of sinful practices (NET). Restitution is required—hollow words are not enough. Note the promises of God in the face of such prayer. “I will hear…forgive…and heal” (NKJV). First, God will “hear.” It is a legal concept. God, the Judge on His throne, grants us, the petitioners, a hearing—He has chosen to rule on our plea. Our case has been taken up by heaven, and earth is likely to feel the impact of the divine ruling. Second, God will forgive—wiping away the sinful record that demands punishment. The judgment will not come. The sins that have separated will be removed so the relationship can resume. Third, God will heal the land—our living places. Consequences for the immoral behavior of the people have been felt by the land. Now, God will intervene. Ecolog- ical advantages of repentance will mani- fest themselves. People will be spiritually healed and the land renewed. God will hear, forgive, and heal to advance His purposes so the world sees more of His glory. 1. Pray to be a better witness, carrying the name of Jesus with poise and dignity. 2. Humble yourself and repent . . . with the nation in mind. 3. Step into the middle—between God and the nation and your city—and pray as an intermediary. 4. Seek God’s face. Escalate your quest to know God. Don’t pray crisis prayers, merely about averting judgment. 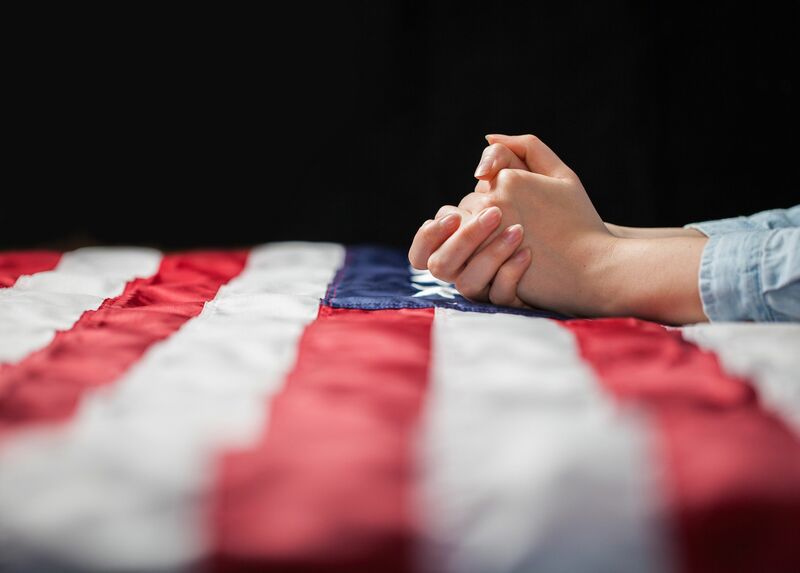 Pray for the nation’s soul, a renewed relationship with God. Seek His face, not merely His hand. 5. Stop any behavior that is less than Christlike. By grace, be a better witness. Lead the way. Influence others by example. Walk in the Spirit. 6. Expect results. Look for evidences of answered prayer. 7. Seek forgiveness and give forgiveness. Reconcile. Put away disputes. Make restitution. Heal divisions. Let love and unity produce a healthy community. 8. Ask God to heal the land. Ask God to renew your family. Pray for divine favor on your city. Believe God to revive the nation.